I'm going to add some notes to this tomorrow, but just wanted to jot some stuff down. 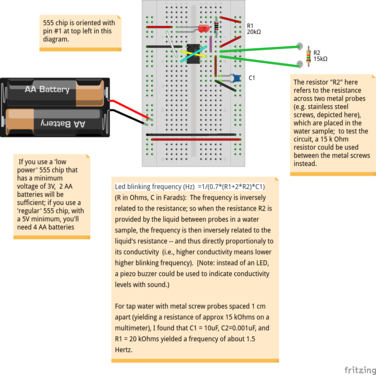 Recipe for a conductivity meter that blinks an LED at a frequency that is inversely proportional to the conductivity of a solution. Wow, very cool. Does the Arduino monitor it via a light sensor? I also want to test the new callouts feature: @mathew, did you get a notification for this comment? This is a design for a crazy-low-cost sensor built only around the 555 instead of a microprocessor. Related to the "sensor cricket" idea of graphing via light or sound. @kanarinka and I chatted about this idea also at PDF, including found an audio version you could leave a voicemail with at the server to submit data or broadcasting it on an "air quality radio channel". @kanarinka can you confirm you got an email notification? Are you using a spark labs kit? I've been offline for the past four days or I would have been all "THIS! THIS!" immediately. because this is awesome! soooooooooo cool. We should see what it costs to do this SMT (smt 555)[http://www.digikey.com/product-detail/en/NA555DR/296-21752-1-ND/1629153]. I bet we can make it super small and with a piezo speaker built in. @dorncox and I "riffed" on this idea today in Somerville... can we call it the Riffle Cricket, maybe, referencing that cricket chirps encode the air temperature? Dorn and I also talked about the potential to put a small solar panel on this and maybe somehow get it to store power until it has enough to "chirp".